Folded paper pyramids can be used to complete many different types of craft projects. Whether you use a printable template or draw your own pyramid, you can transform it into a gift box, memory game, or home decoration. These pyramid printables are designed to be easy to assemble, making them a great option for both children and adults to use in their crafting sessions. Click on the image you wish to download. Open the file using Adobe Reader. Print the pyramid onto the paper of your choice. Cardstock is the best option, since it will result in a sturdier pyramid. Assemble the pyramid by folding along the solid lines and gluing or taping the tabs to the corresponding sides. For the square base design, fold the triangle that is attached to the base first, then fold the rest of the triangles so that they surround the base. With the triangle base design, fold each triangle around the base in the same direction, up or down. Once you make all of the folds, the pyramid shape will automatically come together and you'll see where the tabs should go. If you're using glue, allow time for the glue to dry completely before decorating or using your pyramid. Download a paper pyramid with a triangle base. Download a paper pyramid with a square base. 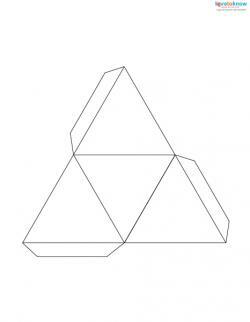 If you want to try making your own paper pyramid, follow the same basic design as the above templates. For the triangle base style, for best results remember that your base must be an equilateral triangle, and that all of the surrounding triangles should be equal to each other in size. If you want to make a pyramid with a square base, the sides of your square must be the same length as the bottom sides of the triangles. 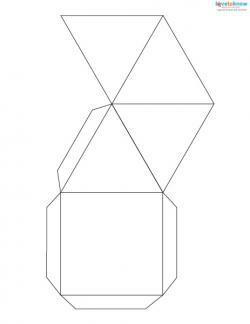 Once you've drawn your pyramid outline, add tabs for assembling the finished design, cut it out, and put it together using the instructions above. Gift Boxes - Paper pyramids can be filled with wrapped candies and used as party favors or small gifts. 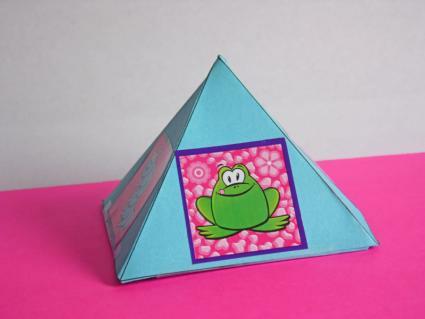 Decorate the sides of the pyramid with stickers or hand drawn illustrations. Photo Display - Glue small photos to each side of the pyramid to make a cute photo display for your bookshelf. Matching Game - Assemble ten pyramids. Add small stickers to the bottoms of the pyramids, making five matching pairs. Arrange the pyramids in a random order on your table and take turns trying to find matching pairs, in the style of a traditional memory game. Advent Calendar - Make a homemade Advent calendar to count down to Christmas. Label each pyramid with a number from 1-24. Fill the pyramids with candy or notes that list a daily activity such as baking Christmas cookies or watching a favorite Christmas cartoon. Open up one pyramid each day. Garden Gnome - Decorate your paper pyramid to look like a garden gnome. Color the tip red and add a small cotton ball to make a hat. Add a face to the middle portion of the pyramid. Paint the bottom blue and tan to give the gnome pants and boots. Egyptian Pyramid - Cover the model with a thin layer of glue. Sprinkle sand over the pyramid to make a miniature replica of the pyramids built by ancient Egyptians. Pyramids are fun paper crafts because they are easy to put together, and they inspire all kinds of creative ideas. No matter what you decide to make with your paper pyramid, remember to have expressing your unique sense of style!